T. S. Chandra Mouli , an academic , poet, translator and critic, is a Fellow of Royal Asiatic Society, Great Britain and Ireland. With 3 books of poems in English to his credit, he published 26 books[19 edited anthologies of literary criticism and 7 authored works]. He completed translation assignments for institutions of higher learning. His poems in English and translations of Telugu poetry and fiction are extensively published. He is the Chief Editor of VIRTUOSO, a Refereed Transnational Bi-Annual Journal of Language and Literature in English, approved by U.G.C. 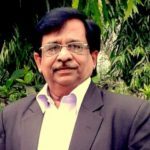 Vice Chairman of AESI [Association of English Studies in India] for a second term, Dr Mouli made panel presentations in International Conferences in universities in China, Thailand, Philippines, Malaysia, Indonesia,the U.K, France and Sri Lanka. Email: tscmouli@hotmail.com; Ph:91-9849005304.